Beginning in 2013, The Fun Palaces movement campaigns for cultural democracy year round, with a weekend of action every year in early October. In this weekend, communities all across the UK (and internationally) run events under the principle ‘community at the heart of culture’ where people participate equally, for free, in any kind of cultural activity. Fun Palaces literally grew immediately through Stella’s network, mainly through Twitter and other social media. The way that Stella and her co-founder Sarah-Jane Rawlings were able to bridge the formal arts world and a totally different world, was transformative to its growth. Endorsement, space and resources from The Albany, an arts centre in South London, meant they could begin a more formal press campaign and target local communities. They had endorsement from many of the top figures in the culture sector but they were also using their contacts to reach out more widely, to communities and connections on the ground. Stella also credits the fact that she was a woman who was ‘a feminist, queer, working class and an activist,’ as a reason for their wide reach. She already felt ‘other’ so the people in her network weren’t the usual roster of arts people, they were diverse in the broadest sense of the word. In Year 1, they didn’t get much help – the museum gave them space but they mainly developed the activities from YouTube and gave it a go. Attendance was ok, but mainly they saw it as a learning experience. ‘We failed at everything that year but we learned from everything. Nobody died,’ she said. In year 2, they had learning to build on. The relationship with the museum developed and that helped them open doors they hadn’t managed before. The museum provided flyers, listed it in their print and newsletter and helped them learn the language they needed to communicate with other formal organisations that could help them. The event grew and more makers got involved and turnout improved significantly. This idea of just starting and having a go, not worrying about the outcome being ‘excellent’ immediately is something that feels core to the root of Fun Palaces. It’s how the whole movement began, so the ethos is passed on, meaning people are able to get involved at whatever level they feel able to. This leads to some hugely impressive statistics in terms of diversity across all spectrums – Fun Palaces truly are for all, because they don’t make a judgement about people before they arrive. As a result of running her Fun Palace Carine, a migrant to Britain, feels much more at home in her local community. ‘I know the people around me; I know their names so we can have a chat…. It wasn’t easy to integrate when I moved to England.. But Fun Palaces helped me do it’. She now volunteers at the museum (who are also a part of the Fun Palace now) and this year she is programming the fete for the museum. The Fun Palace has created such a buzz that people want to be part of it and the relationship between the Fun Palace and the museum and library feels reciprocal – the Fun Palace brings in new audiences and Carine feels she learns a lot from the formal organisations. This year a participant came along who had social anxiety and through the welcoming and iterative nature of the process now feels confident to run a workshop in this year’s event. Carine stressed the importance of it not being about getting it right – ‘whatever you do will be good enough – the process is the main part, what happens on the day is not what it’s all about.’ The nature of this invitation makes it possible for people to participate who might not otherwise feel comfortable to. There’s an openness to it that takes the pressure off, this feels at the very essence of Fun Palaces. 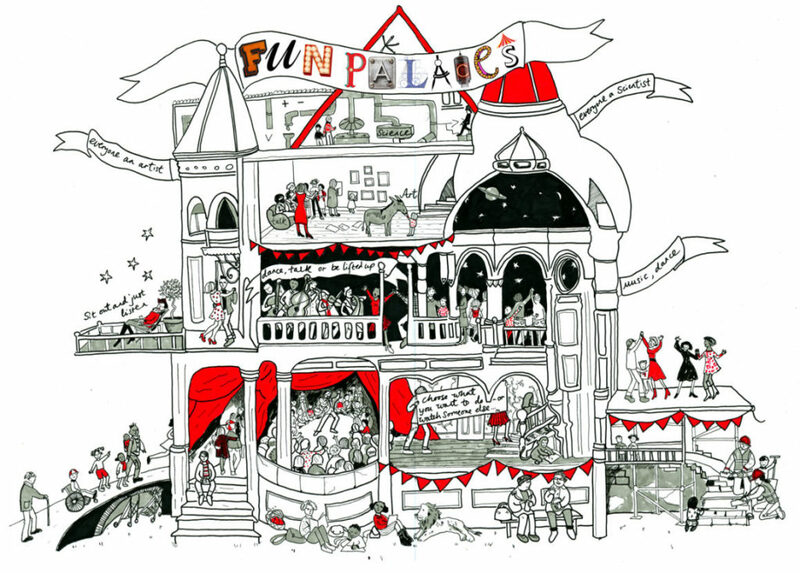 Make a Fun Palace for 6th & 7th October to shine a light on culture in your local community. The website above is jam-packed with resources and tools to help you and they are just a tweet or email away for questions (@FunPalaces) or use their website contact form here – why not start planning yours now?